After all these months, I finally have a fabulous vegan pumpkin pie recipe to share with you! What took me so long? Well, for such a seemingly simple dessert, vegan pumpkin pie can be tricky to make. Over the years, I’ve tested at least a dozen recipes. Each one was plagued with either a filling that wouldn’t set properly, a massive crack down the center, or a lousy crust (i.e., soggy, doughy or shrunken). Whoever coined the term “easy as pie” had obviously never made a pumpkin pie! 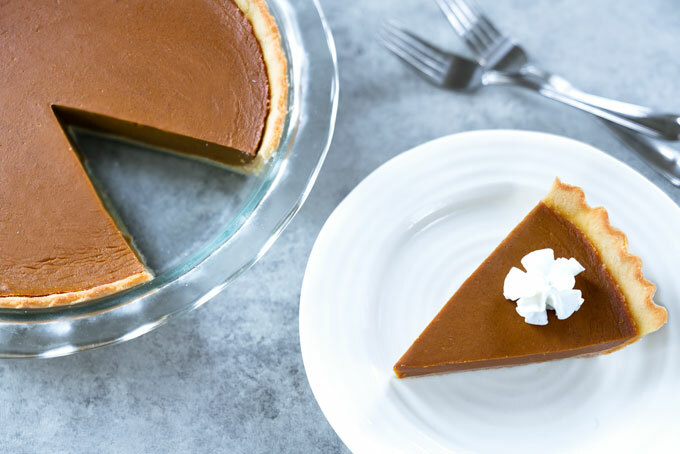 This pumpkin pie is not only vegan, but it’s also paleo and the filling is entirely no-bake. And have I mentioned how delicious it is with coconut whipped cream? When you think up Thanksgiving desserts, pumpkin pie is probably the first one that comes to mind. 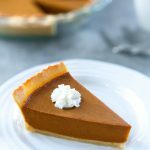 Associated with nearly every holiday occasion that embodies joy, pumpkin pie has established itself as a signature dish. Few things are as synonymous with the holidays as pie. I grew up in Europe where we don’t celebrate Thanksgiving. However, the first time I tasted a pumpkin pie was indeed at Thanksgiving. My sister and I got invited to a Thanksgiving dinner hosted by a Canadian family who just moved next door. Our first doubtful response, upon seeing a pumpkin pie, was “You serve this how? As what part of the meal?” When it came time to actually sample the pie, my sister and I were trying really hard to hide our polite cringes as we were raising our first-ever fork full of pumpkin pie. What followed was a look of surprise and delight upon tasting pumpkin pie for the first time, along with the much larger second helping we cut for ourselves. If you’re not a fan of pumpkin pie but still want that harvest-y autumn feeling at your Thanksgiving dinner, there are plenty of other desserts you could try. How about apple crisp or apple pie? If not apple pie, then anything with pears – poached pears served with vanilla ice cream would be great too! I used a blend of almond flour and coconut flour for the crust. Make sure you use very fine flours (or grind them yourself at home). There is no substituting almond for coconut flour or vice versa. The liquid ratios will be way off if you do. A flax egg is what’s holding the crust together. I prefer golden flaxseeds, but you can use any flaxseeds you like. Golden flaxseeds have the same property as brown flaxseeds; they just mimic the color of eggs better. I usually make pumpkin pie filling with my own pumpkin puree. The real question is, “Is it worth it?” After all, if you’re going to take 2-3 hours out of your life prepping fresh pumpkin for a pie, it had better be a pretty amazing pie, right? Canned pumpkin is convenient and consistent and it’s 100% pumpkin with nothing added. But does it lose any of its fresh pumpkin flavor? My answer may surprise you: it doesn’t. In fact, my husband prefers pumpkin pie with canned pumpkin puree. He says that the spices taste more pronounced and the flavor is more integrated. Talking about spices…For many people, there’s something about that signature mix of cinnamon, ginger, nutmeg, and clove that instantly feel like home. I also add a little bit of vanilla extract and a pinch of sea salt for a wonderfully spiced filling. Traditional pumpkin pie contains some type of heavy cream or evaporated milk. Since I wanted to keep this pumpkin pie vegan, I decided to use full-fat coconut milk instead. It worked like a charm! Another swap I needed to make were the eggs. This took some trial and error, but my favorite pumpkin pie filling has a little bit of kuzu root and agar agar powder. Kuzu makes the filling smooth and thick while agar helps the filling to set. You absolutely need to use both. If you use just kudzu, you’ll end up with pumpkin pudding. If you use just agar, you’ll get pumpkin jello. Chances are you’ve never heard of kuzu (also known as kudzu). It’s a starch that acts just like any other starch with the benefit of being a superfood. Kuzu is widely regarded as the healthiest cooking starch in the culinary and confectionery world, as well as the medicinal world. The sweetener is up to you. I used coconut sugar, but you can use any powdered and/or liquid sweetener you like. I tested this vegan pumpkin pie recipe with maple syrup as well, and it set perfectly. There’s no rolling required with this crust. Once you have the dough, just press it into a greased pie dish. I like to press the edges against the rim to help the crust stay put as it bakes. As I was pressing the crust in, I was worried that I wouldn’t be able to remove the crust from the pie dish afterwards, but it wasn’t an issue at all. Since it’s a no-bake pumpkin pie, It’s important to blind-bake the crust before filling it. The crust will puff up during baking if you don’t fill it with pie weights or dry beans. So, either watch the crust closely as it’s baking, or carefully line the pie dough with parchment paper and then add some weights. The disadvantage of using pie weights or beans is that the bottom of the pie crust doesn’t really cook. So, what I like to do is use a fork to prick a few holes in the crust. This allows steam to escape and prevents lots of puff. You might also want to use a pie shield or strips of aluminum foil to prevent the crust edges from browning too much. There is nothing worse than a cracked pumpkin pie. (OK, that’s an exaggeration, but you get my point). Cracking is supposedly caused by over-baking, but I found that the cracks formed even when I under-baked my pies or cooked them perfectly. So, I decided to switch to no-bake filling. As long as you follow the amounts of each the kudzu and agar, your pumpkin pie filling will set perfectly (no cracks guaranteed!). 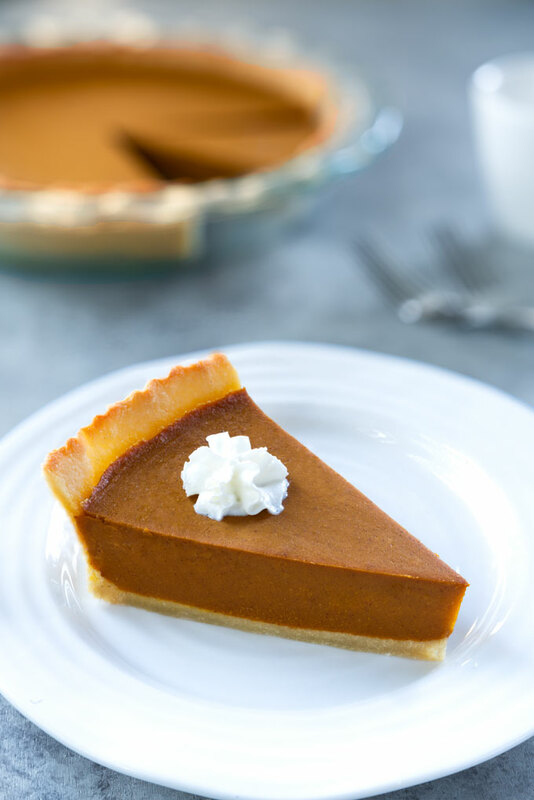 This vegan and paleo pumpkin pie will be the best Thanksgiving dessert at the table! 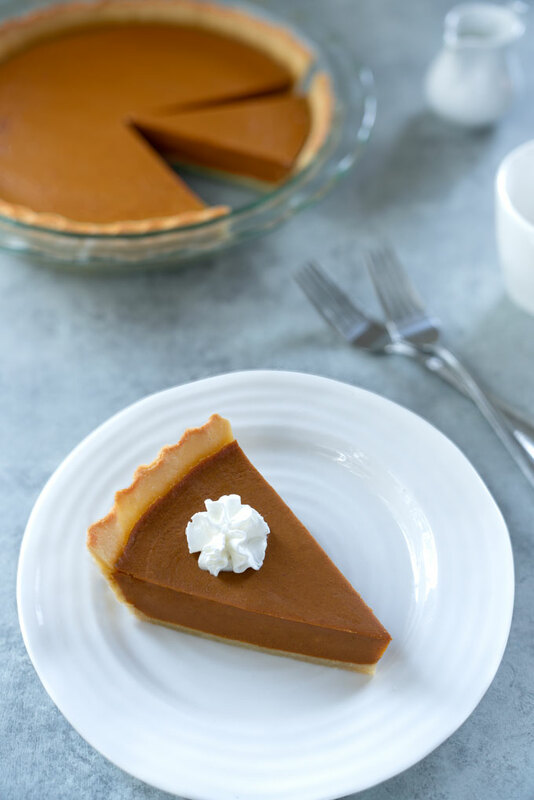 Perfectly crisp crust with creamy, wonderfully spiced pumpkin pie filling. Combine the almond flour, coconut flour, and salt in a large bowl. Add the coconut oil, maple syrup and flax egg and work it into a dough. The dough will seem crumbly at first, but it should come together just fine. Grease a 9-inch round pie pan with a little bit coconut oil. Spread the crust dough evenly in the pie pan, making sure to press it firmly so it sticks together. Press the edges down against the rim — this will help the crust stay put as it bakes. Crimp the edges with your fingers or press with the tines of a fork. Cover the crust with a sheet of parchment paper and fill it halfway with dried beans or pie weights. (If you don't do it, the crust will dome as it bakes). you might also use a pie shield or a few strips of aluminum foil to prevent the edges of the crust from browning too much. Bake the crust until the bottom is just beginning to color, about 20-30 minutes. Blend the pumpkin puree, coconut milk, coconut sugar, spices, vanilla, and salt in a high-speed blender. Pour a few tablespoons of the pumpkin pie filling into a medium saucepan and dissolve the kuzu root starch. Add the agar agar powder and dissolve it as well. Pour the rest of the filling into the saucepan and whisk to combine. Bring the pumpkin pie filling to a gentle boil. Gently simmer, stirring constantly, until thickened, 2-3 minutes. (The mixture does have to boil in order to activate the agar). Pour the hot pie filling into the pre-baked pie crust. Let it set on the counter (or in the refrigerator) until firm, 3-5 hours. *1 Tbsp. (7 g) golden flaxseed meal + 2 1/2 Tbsp. (37.5 ml) water. Whisk and let the mixture sit for 10 minutes. Then use as instructed. **1 (15 0z) can equals 2 cups pumpkin puree. ***Feel free to substitute the kuzu starch for arrowroot starch. Happy Thanksgiving to you & your family. What can I sub for kudzu & agar if I don’t have them in my pantry? Thanks! Your pumpkin pie looks delicious, I have to give it a try! I’m not sure if I can simply grinde almonds for almond flour? Will it work as good as store-bought almond flour? Hi Ania – you can definitely grind the almonds yourself. But just something to keep in mind – I used finely ground almond flour made of blanched almonds. So, if you want to make the flour at home, I would recommend blanching the almonds first and then grinding them into fine flour. If you’ve never made almond flour at home, I just want to warn you that there is a fine line between finely ground almond flour and almond butter. (Almond flour turns into nut butter quite quickly), so make sure you don’t over-process the almonds. Feel free to reach out if you have any more questions. Hello! Happy Thanksgiving, although here in Portugal we dont celebrate it :p.
This recipe is perfect this time of year, mainly because I have 2 packs of agar agar in my pantry and never knew how I would use it. Hi Rute – hope you enjoy the recipe. If you have a lot of agar powder and are into making jams, that’s a great place to use it too (instead of gelatin 🙂 I make jams with agar powder all the time! Hi Petra! How about combining your the pie crust (adding maybe some raw cacao to it) and your chocolate mousse, to make a chocolate pie? Do you think it would work? Second question: could I use the dough to make cookies? What do you think? Thank you once more for the lovely recipes! Hi Joanna – yes, I think that the chocolate pie idea is brilliant! I have never tried, but I can see it working really well 🙂 As far as the cookies go, it depends on what type of cookies you’re looking for. The pie crust does work for cut out cookies (thin and crispy). Thank you for the lovely comment and ideas ❤ Let me know if you have any more questions. The pie looks amazing!! However would you please add the nutritional values.